At 6:44 and with the rising sun only a minute below Nevada’s Pine Nut Mountains, a small bus packed with 16 men rolls through the Carson Valley Inn Hotel & Casino parking lot toward U.S. Route 395, on the start of a raucous 18-hole round of golf played over nine different public courses within a 25-mile radius, which will take more than 12 hours and end only after the transiting sun dips behind the Sierra Nevada. This is Dinger’s circus and, for the day, we are his monkeys. 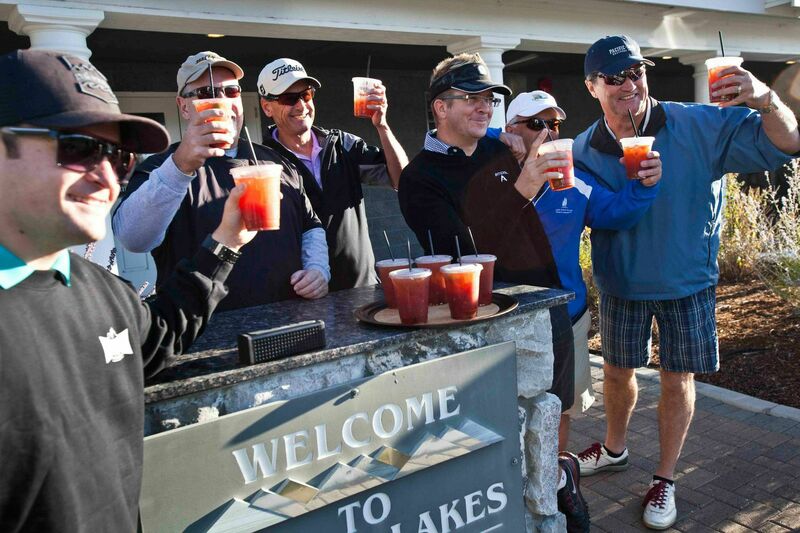 Founded during the epochal mists of the Clinton Administration to publicize Carson Valley golf and tourism, the annual trek for writers and broadcasters has attained a near mythic reputation within the profession. An invitation to participate is something of an honor, however dubious, even while participation can evolve into a back-wrenching ordeal. And though most golfers would rather contract shingles than play a long round of golf, this particular journey is anything but dull. Since speed is paramount if we’re to finish before pitch dark, Weidinger has the group self-divide at each course, so that eight players tackle holes simultaneously, teeing off at the same time and dodging greenside shanks and scuds rocketing out of bunkers. Dinger forbids warm-ups, practice swings, plumb-bobbed putts and orders everyone to pick up after eight strokes and keep moving. “We’re burning daylight,” he barks at frequent intervals. We are not burning weed, at least not like the passengers on Ken Kesey’s fabled Further, the tie-died vehicle immortalized in Tom Wolfe’s Electric Kool-Aid Acid Test. 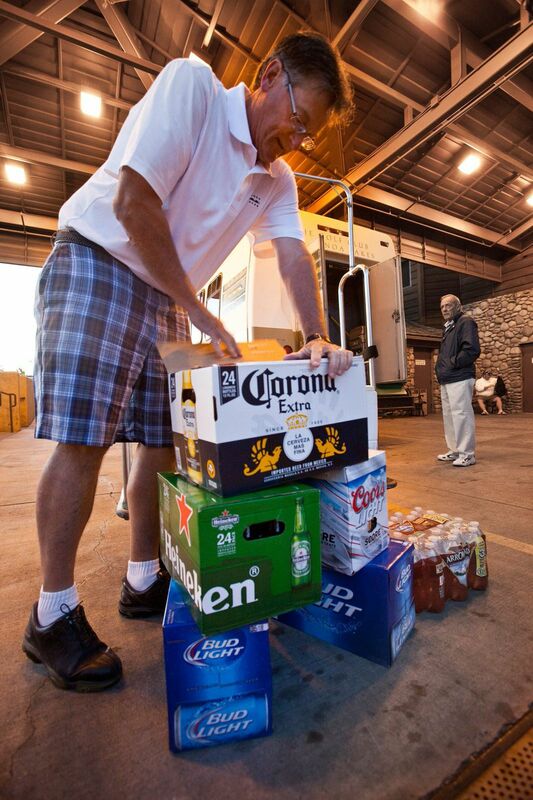 Instead, the riders on this small party bus are plied largely with the aforementioned beer, kept in an industrial-sized cooler that takes up two seats and is packed with 120 cans and bottles. While it used to be named Chad Hartley, after a Reno reporter who was “big and always full of beer,” the title going forward may well fall upon another Tour veteran of substantial size, vocal volume and thirst. With eight golfers playing each hole at the same time, greens looked like herds of grazing critters. Photo by Rick Gunn. female journalists on this year’s Tour, who in the past had a tempering influence on general civility. With few restraints on uninhibited sharing, crude bodily functions and vulgar jokes flow as freely as did the Bud Light. Speaking of jokes, the Tour also included one civilian, Darrell Schue of South Lake Tahoe, the winner of a contest for the best golf quip, sponsored by San Francisco’s Hooked on Golf KNBR radio show. Most golf jokes are crude and misogynistic, and this one is no exception. Google the words golf joke, lesson and mouth, and it will pop right up. 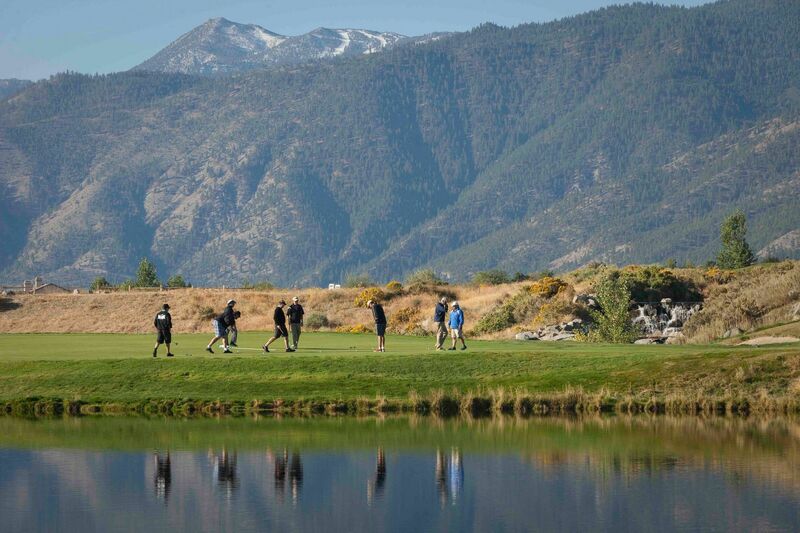 In competition with Reno and the Lake Tahoe areas, the Carson City Convention and Visitors Bureau and the Carson Valley Chamber of Commerce formed a cooperative to market the area’s myriad attributes, which go far beyond golf. Nevada, of course, is well known for its 24-hour lifestyle of gaming, entertainment and clubs. Only a four-hour drive from the San Francisco Bay Area, the Carson and Dayton Valleys are also an outdoor paradise, offering biking, hiking up the fabulous Clear Creek Trail, fishing, soaring, horseback riding and more. Accommodations? Try the incredibly comfortable beds at the Holiday Inn Express in Minden. Fine dining? The final stop on the post-round Divine Nine Tour was a superb family style meal at the J.T. Basque Bar & Dining Room in Gardnerville. What’s more, the Old West is quite alive and well in and around the Comstock Lode of silver ore, which in the second half of the1800s led to the construction of the well-preserved Virginia City, just up the road from the Dayton Valley golf course, part of the Divine Nine. Other historic Old West attractions include the Virginia & Truckee Railroad and the Nevada State Museum in Carson City. And then there’s Nevada’s oldest drinking establishment, the Genoa Bar & Saloon, where you can almost imagine Mark Twain as a young reporter with the Territorial Enterprise, sitting at the bar taking notes for a column and pounding down a rye. references to grazing sheep, all of which are interrelated. And even though we are men, the golf courses turned most of the journalists into Dinger’s monkeys. triple digits. We lost 41 balls. Designed by PGA Tour player Peter Jacobson and the late John Harbottle III, the Lakes Course at Genoa Lakes is a links-style course where the rolling fairways run up against the eastern slopes of the Sierra Nevada, featuring wetlands, the Carson River and abundant wildlife. 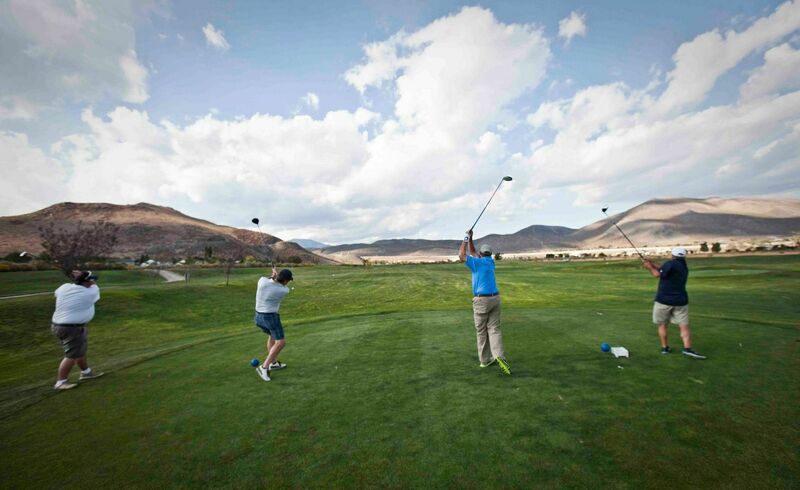 Up the road is the Genoa Lakes Resort Course, designed by Harbottle and golfer-broadcaster Johnny Miller, with numerous water hazards and scenic views of the greater Carson Valley. We then played two holes at the Sunridge Golf Club, which is a fascinating blend of meadow, water and hillside holes. Dayton Valley is one of the more remote and yet best-known courses on the Divine Nine, designed by Arnold Palmer and host to PGA Tour Qualifying events since 1995. 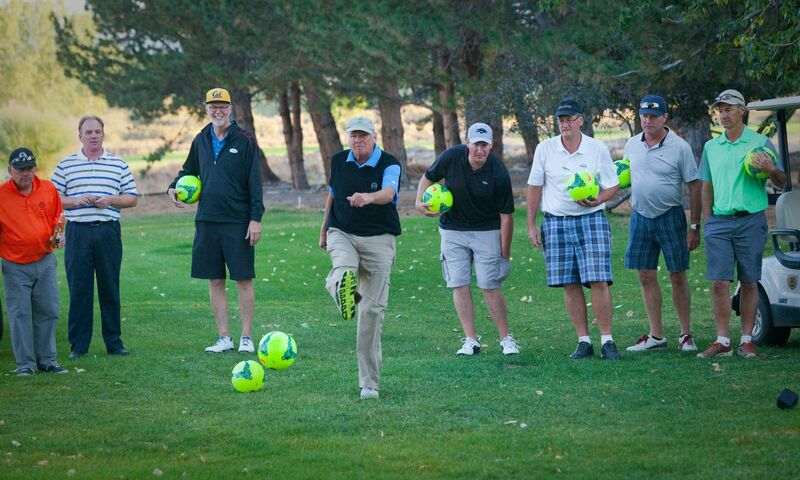 Run by the innovative and irrepressible Jim Kepler, Eagle Valley East and West are local treasures, serving senior citizens and young golfers alike with almost free play. Overlooking the Carson River and flanked by bluffs, the Empire Ranch Golf Course is a 27-hole layout that sits on 250 acres, much of which is wetlands. Spread out of 150 acres north of Carson City in the Sierra foothills is Silver Oak, a spacious, interesting and well-maintained layout. Winding through tall cottonwoods along the Carson River is the much-beloved Carson Valley Golf Course, long owned by the family of Tom and Manya Brooks. 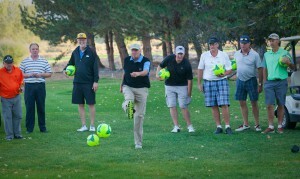 Like many other courses in the area, Carson Valley has added Foot Golf, which is played over 18 holes on a shortened area of the course, by kicking a soccer ball to a 21-inch cup. Fire up the bus fellas, since this could be an excuse for yet another strange trip.